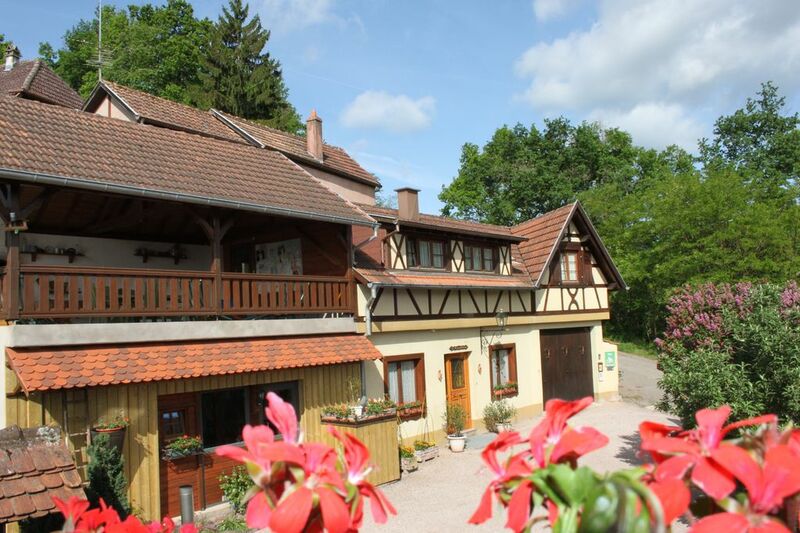 Alsatian charming house classified "Gîte de France 3 * 3 épis"
Alsatian charming house classified "Gîte de France 3 * 3 épis" for 4/5 persons, quiet, in the center of the Alsace wine route and close to the most typical monuments of the region. The village of Nothalten is located halfway between Colmar and Strasbourg. Its central location will allow you to radiate all over Alsace, the Vosges and Germany. - 1 equipped kitchen: oven, dishwasher, microwave, coffee maker, kettle, toaster, various stoves etc. - 1 bedroom with bed 160 x 200, two bedside tables, a wardrobe, a cot. - 1 bedroom with two single beds 90 x 190, a wardrobe, bedside tables. - 1 separate WC from the showers. - 1 bathroom with shower, washbasin, washing machine and cupboard for towels (provided free of charge). - 1 large covered terrace with garden furniture will enhance your evenings. Possibility of hiring at night and week. We can also offer you breakfast as well as a final cleaning option of stay. We have recently retired. We want our guests to have a pleasant stay. We are available at any time for enquiries. Our first room is composed of a bed of 160 x 200. The beds are made on arrival. Towels and kitchen towels are provided free of charge. You have free WIFI access. Possibility of breakfast service with supplement. Baby kit. Documentation of the region available. shower, Towels provided free of charge. Towels and bathroom linen are provided free of charge. Simone's lovely house was a perfect place to stay during a long weekend in the Alsace region. The rooms were clean and cozy, and she even left us a bag of cookies as a welcome gift. Sitting outside and drinking coffee in the morning on the deck was beautiful and relaxing, and she also prepared a lovely breakfast for my mom's birthday. With close access to hiking trails, great restaurants, and wineries, I would love to return for an even longer stay! Thank you very much for your nice review. I was delighted to meet you. We have just received the keys and we thank you very much. We wish you all the best and will always be delighted to see you again. Très bon accueil des propriétaires qui mettent tout en œuvre pour notre bien-être. L’endroit est spacieux, chaleureux, bien organisé et d’une propreté remarquable. Bonjour, Nous vous remercions chaleureusement pour votre beau témoignage. Nous faisons le maximum afin que nos hôtes soient satisfait de leur séjour. Nous vous souhaitons une bonne continuation et merci encore à vous 3. Adresse à découvrir rapidement pour passer un agréable séjour dans le vignoble Alsacien .Gite de qualité , très complet , confortable et spacieux. Le plus dans le séjour: la gentillesse et la disponibilité des propriétaires . super séjour trop court !! Nous avons déjà séjourné dans beaucoup de gîtes et locations...mais...un comme celui-là....jamais !! Que du positif...pas moyen de trouver de négatif !! Les propriétaires bienveillants...aux petits soins...c'est du jamais vu !! Merci beaucoup pour ce beau commentaire. Nous avons été ravis de faire votre connaissance. De comfortabele bovenwoning heeft alle gemakken die wij zochten. De woning was een ideaal uitgangspunt voor onze wandelingen. Het grote balkon, met barbecue is een heerlijke plek en biedt uitzicht op de wijnvelden De gastheer en -vrouw waren bijzonder gastvrij en geïnteresseerd in hun gasten. Dank voor jullie gastvrijheid. Hartelijk dank voor deze mooie getuigenis. We waren blij om je te ontmoeten. Close to: Sélestat: 20 km away Strasbourg: 35 km away Shops: 8 km away. Un supplément de 11.00 € est demandé pour les petits déjeuners pour les adultes, pour les enfants de 6 à 13 ans 8.00 € et pour les moins de 6 ans le petit déjeuner est offert. Nous pouvons vous proposer un forfait ménage en fin de séjour à raison de 40.00 € en sus. La taxe de séjour obligatoire est de 1,10 € par nuit et par adulte. Nous ne demandons pas de caution. Un acompte de 25% est demandé lors de la réservation et le solde lors du séjour.